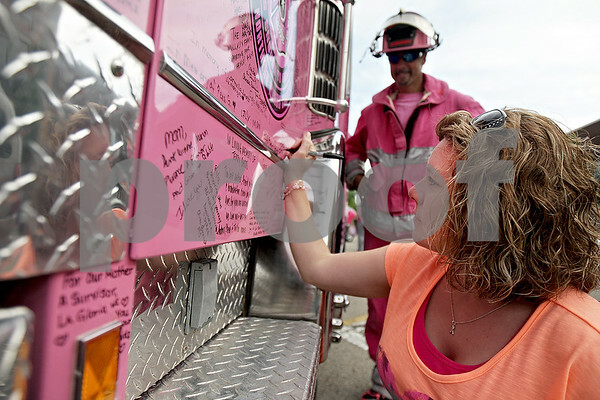 Clarice Pepper, 33, of Kirkland, signs Jessica, the pink fire truck, in honor of her aunt Sarah who passed from breast cancer at the ninth annual Ladies Night Out event for breast cancer awareness in downtown Sycamore on Thursday, July 6, 2013. Jessica, with the Northern Illinois Chapter of Pink Heals, was driven down from McHenry to be at the event. There are now 80 fire trucks like Jessica around the country spreading education, awareness and support for breast cancer.